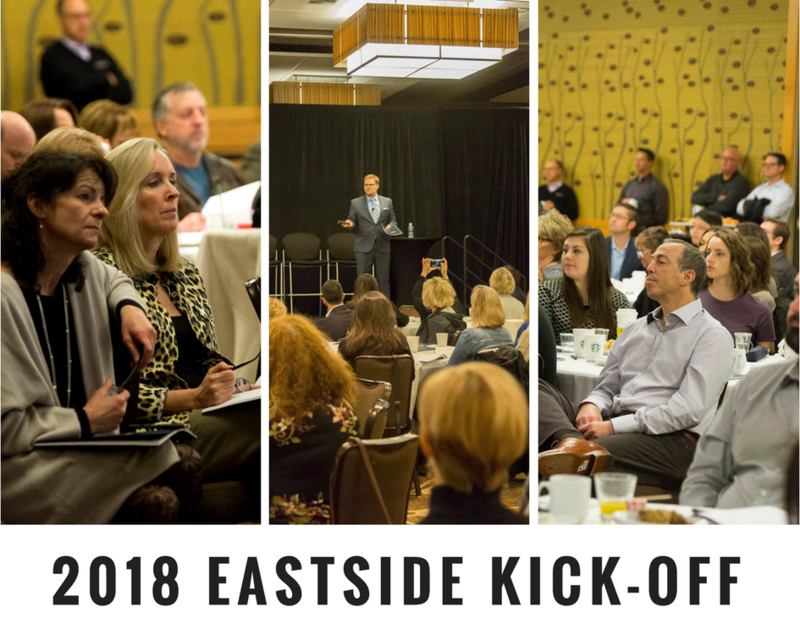 Every year over 500 brokers from Windermere offices across the Eastside gather to prepare for the new year at the annual Windermere Eastside Kick-Off Event at the Hyatt Regency Bellevue. Last week, several speakers shared their insights and advice to prepare our agents to better serve their clients for the 2018 housing market. Matthew Gardner, Windermere Real Estate’s Chief Economist, shared his forecast for the 2018 housing market. Low inventory seems to be a problem stretching all the way to Ohio with many people living in their homes twice as long as past generations. Lack of skilled labor, available land and high material costs continue to make new construction an expensive option. Read more about his forecast. Senior Vice President Windermere Services and Ninja Instructor, Michael Fanning, brought his insights on breaking thought the mediocrity of the market place. Finding ways to bring those extra touches and using technology to your advantage can set you apart in a sea of daily distraction. Employing techniques from the Ninja Installation Train Program, Michael reminds agents that the hard things never get easier, you just get better and an average mindset will always result in a missed opportunity. Licensed marriage and family therapist, Tori Dabasinskas, shared her communication strategies to help our agents better connect with their clients. Addressing techniques for authentic listening, creating more meaningful connections and responding with emotion as well as logic, Tori emphasized taking time to truly understand the “story” of each individual client. With personal empathy and active appreciation, our agents can better anticipate the needs of their clients and what can be done to better serve them. Executive Vice President of HomeStreet Bank, Richard Bennion, reminded our agents that every client has a story. Their hopes, dreams and challenges are opportunities to listen, be attentive and show those clients their importance. Becoming an expert who is professional, authentic, self-aware and highly competent will attract people and help build your business’ sphere of influence. Taking a long-term approach in building client relationships will result in a strong business over time. Brooks Burton, Chief Operating Officer for Windermere Services Company, opened the Kick-Off by sharing some exciting changes agents can look forward to in 2018. They included refreshed branding, offering more social media resources, improving technology and more resources based on agent feedback. Brooks also touched on the success of the Windermere Foundation which has raised over $35 million for local organizations since its inception in 1989 as well as how funds are allocated among those organizations. David Wasielewski, the Managing Partner of Northwest Din Tai Fung Partners, spoke about bringing the popular Chinese restaurant brand to the Seattle area. David shared that as a previous marketing veteran at Intel Corporation he had no restaurant experience prior to starting his own business. David’s approach to success? Strategy, action, and pacing himself. He flew to California for many weekends to work at another Chinese restaurant owned by Din Tai Fung’s owners without pay to prove his interest and dedication to his mission. Fast forward to today and he owns four restaurants in the Seattle region and his first Bellevue Square location has won the highest gross sales award from Kemper Development Company in each of the five years he has operated. Tracie Ruiz Conforto, Olympic Medalist and Synchronized Swimmer of the Century, inspired us to find and pursue our passions, just as she did with swimming at the age of nine. She advised agents on three ways to achieve excellence – find your passion, use your competition to improve your skills, and surround yourself with a team who will support you. Tracie showed us that anything is possible when you combine passion, discipline, competition, and teamwork. The Windermere Eastside Kick-off was an inspiring and motivational event. Our brokers are more prepared than ever to provide valuable service for their clients and face the year ahead. We are excited to put this knowledge to good use as we help you navigate your real estate journey in 2018!